These are the basics. 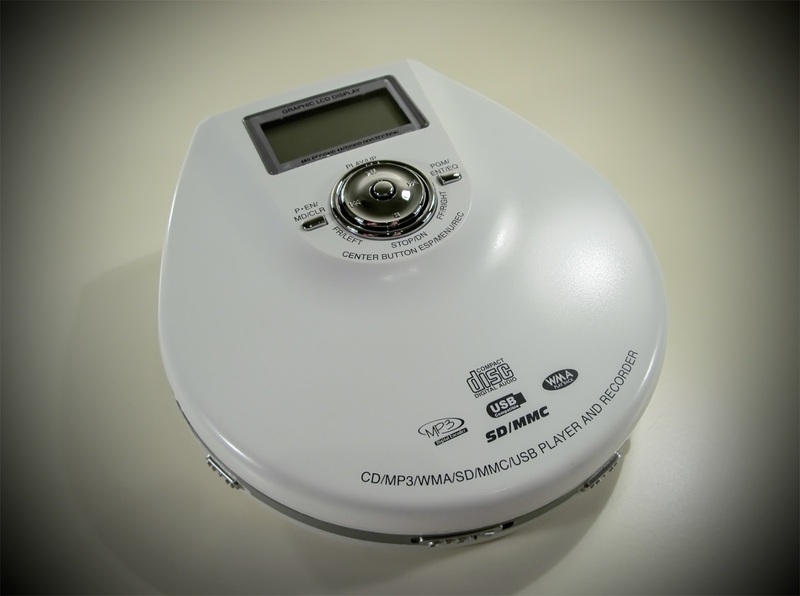 Apart from that it can do what other portable CD players can do: skip tracks, searching within them (works with MP3 too), you can program a tracklist, random, repeat, etc. Apart from the headphone output it also offers a line-out (probably fed by the same amp driving headphones). Ah, while I´m at it: I´d love to tell you something about the ICs it uses... but sadly, I cannot find many of the ICs anymore. I only know that the D/A converter is a 1-bit DAC with 24 bit resolution, manufactured by Panasonic. Decoding of MP3, WMA and other DSP-related stuff is achieved by a SoC (ARM design) from MCS Logic. But who is Ciron? I only know that the company doesn´t exist anymore. It was a reseller from Germany, founded in 1999. They sold electronic items like this one for cheap money and, apparently, they didn´t do this too well since they went broke sometime around 2009. In any case, they were only reselling the QXX-28. It was built by someone else and it has been impossible to find out who exactly built it. The only thing I found is a link to an even more feature-heavy version of the QXX-28, able to play DVDs (click here). But how is the built quality? Like you would expect it to be for a gadged this cheap. It´s white of course, 'cause white has been all the rage thanks to Apple. The plastic housing feels thin and cheap, buttons are wobbly (especially the center button on the lid) with an awful tactile response. The firmware too has some problems: MP3 and WMA playback isn´t gapless (there´s a pause of roughly 2 seconds between each track), it sometimes crashes, even when it does something easy like playing back CDs. The grabbing-to-USB/SD/MMC is useless; it does this with 1x speed and the quality of the encoding is generally awful. 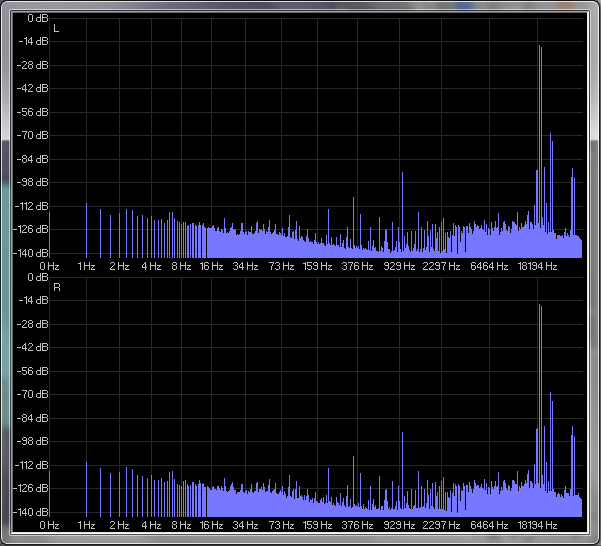 Otherwise, playback of lossy codecs works well (including sound quality). The ESP is of the ADPCM compressing kind with all its advantages and disadvantages. 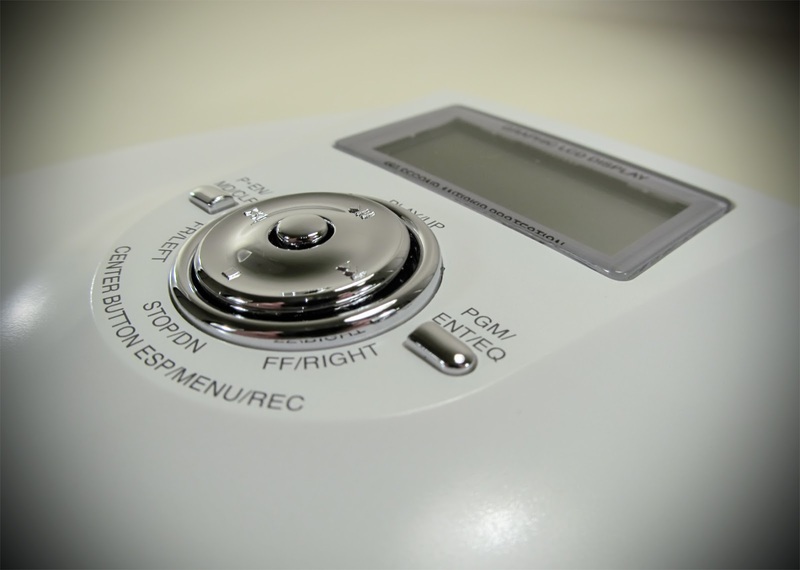 It´s always active unless you switch it off using the center button (it´ll stay off as long as the QXX-28 has power). And the sound? 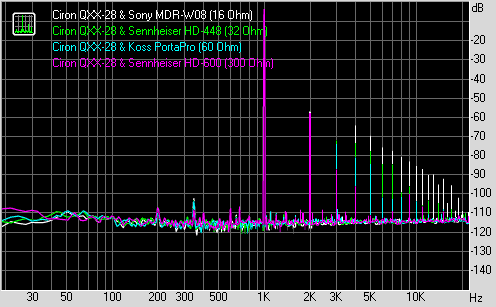 Ergh... the headphone output might actually be usable if there wouldn´t be the high noisefloor. 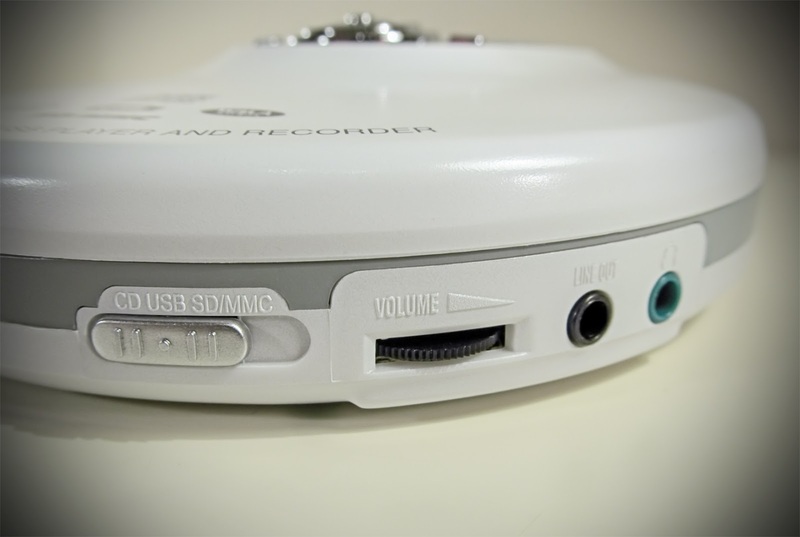 Noise is almost always audible and the amount is independent from the setting of the Volume wheel. For low-impedance headphones (you know, the ones most certainly used with portable devices) it´s completely useless because of a relatively high output impedance causing bass drop-off and frequency errors. But it works like a charm with the Sennheiser HD-600: noise is absent (because of the HD-600s insensitivity), impedance errors are too and - lo and behold - it even gets loud enough! But for portable use? Forget it. I´ve said it often enough: the price of an audio device rarely relates to its sound quality. 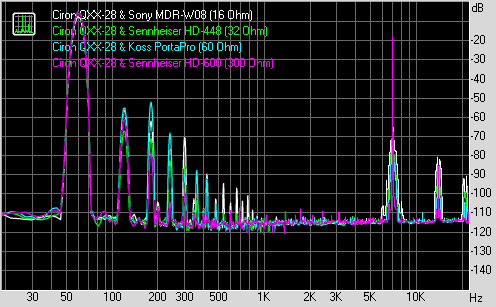 The QXX-28 sounds surprisingly good. Really. Provided you switch off the ESP. If you do so, you´ll be rewarded with a stage that´s exactly as wide as on my reference files. There´s only some very slight impairment of image stability, soloists in the center of the stage feel a tiny bit more distant with impaired articulation. 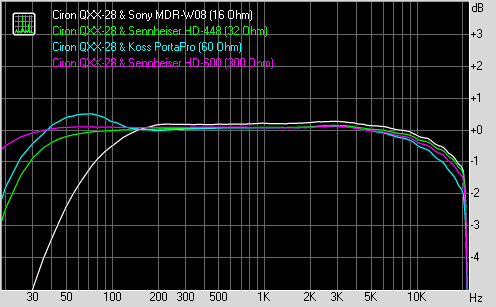 Bass is good, apart from a sometimes audible drop off of lowest frequencies (below 80 Hz I´d say). When it comes to precision and definition, the QXX-28 smoothes the impact of high frequencies. Details however are on par with the reference. 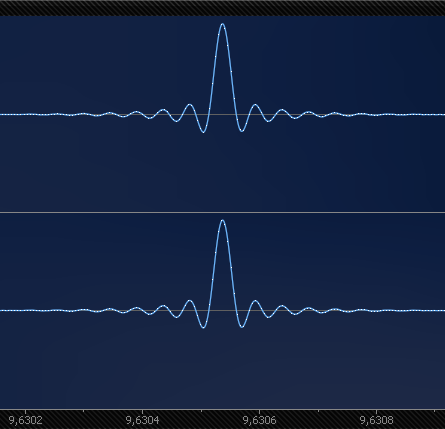 Smoothing treble usually affects dynamics; this is apparent on the QXX-28. It´s slightly less snappy than the references but otherwise fairly close. All in all, this is the best of all the 8 players I´ve reviewed for this comparison, in part because it doesn´t exchange the character of the music it plays with its own, it completely retains it. I´ll make short work of this section... people don´t seem to be interested in measurements. It´s stupid to ignore them (electronic devices are pure science, therefore they adhere to scientific principles like... measurements) but that´s the way it is and so I have to deal with it. For that reason, I´ve skipped the graphs and my explanations. Take the remaining pictures as you like. 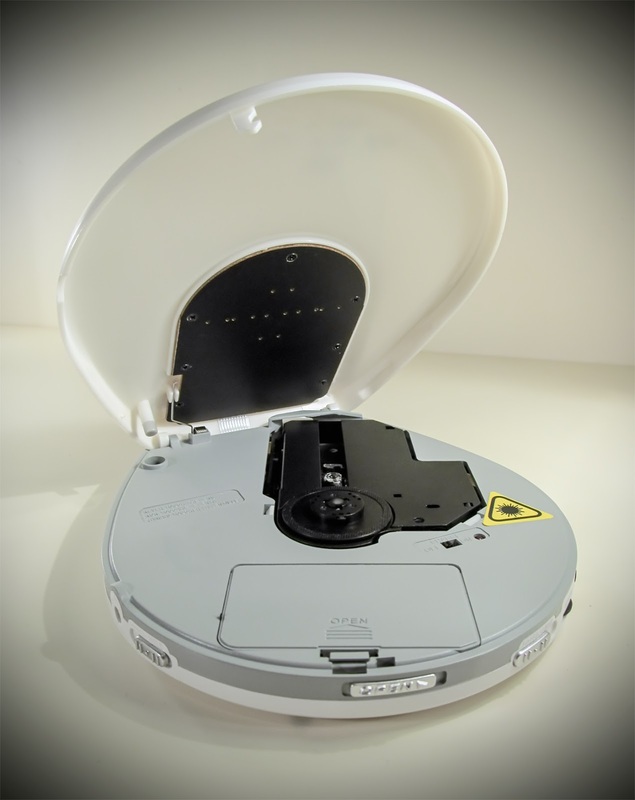 Anyway, for a portable CD player that´s as cheap as the QXX-28 the measurements are more than ok. Fig. V was done with my usual test CD, Fig. 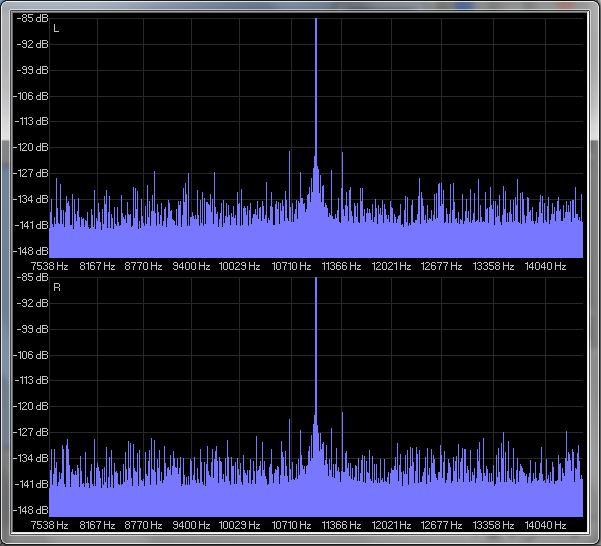 VI was done with MP3 files (320 kBit/s) and the results show that this player decodes MP3 with full floating point. Wow! I´ve never expected this. This old, cheap player adheres to the recommendations I made in November 2013. Stunning. would it be possible to provide the manual on this web page? No, sorry. I don´t publish Manuals. Hi Jörn! You have any experience with defects of the QXX? Mine just doesn't start anymore... Worked well before. Many thanks! I actually haven't used it since reviewing it for this article. So I don't have that much experience apart from what I was writing about here, sorry.